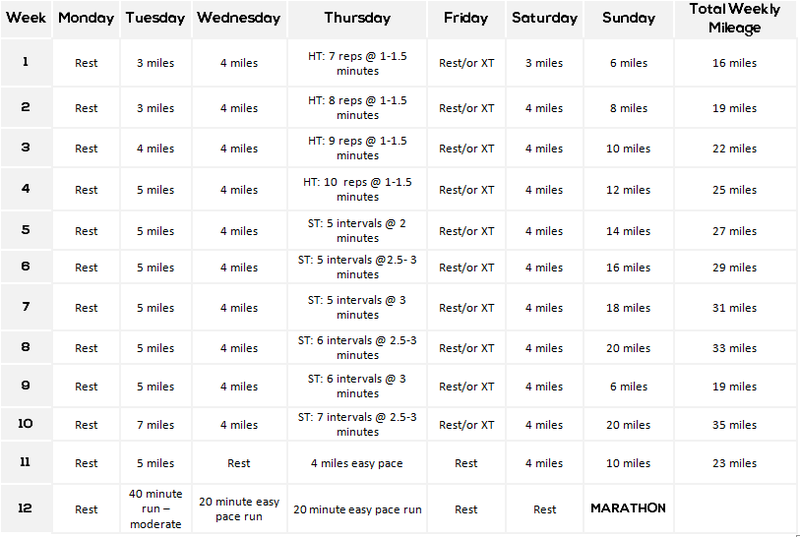 This 12 Week Marathon Training Schedule is designed for those runners who have already previously run a marathon. 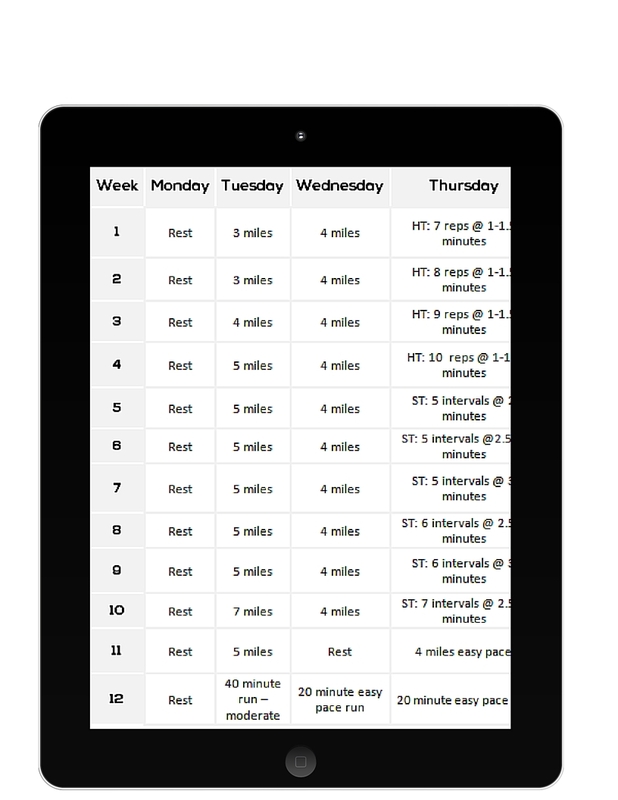 It takes you at a rapid pace from a long run of 6 miles to a long run of 20 miles in 12 weeks. 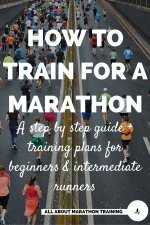 If you can run at least 4 miles and preferably 6 miles, comfortably, and you have previously run a marathon, then this plan is an option for your training. In weeks 1 through 4 you will be building a foundation and working your long run mileage from 6 miles up to 12 miles. Your total mileage will increase from 16 miles in Week 1 to 25 miles in Week 4. You will be performing hill intervals - see this page for information on hill training - on Thursdays, increasing your hill reps each week from 7 to 10 repetitions. This will allow you to gain strength and stamina and set you up for your speed training that will occur during weeks 5-10. 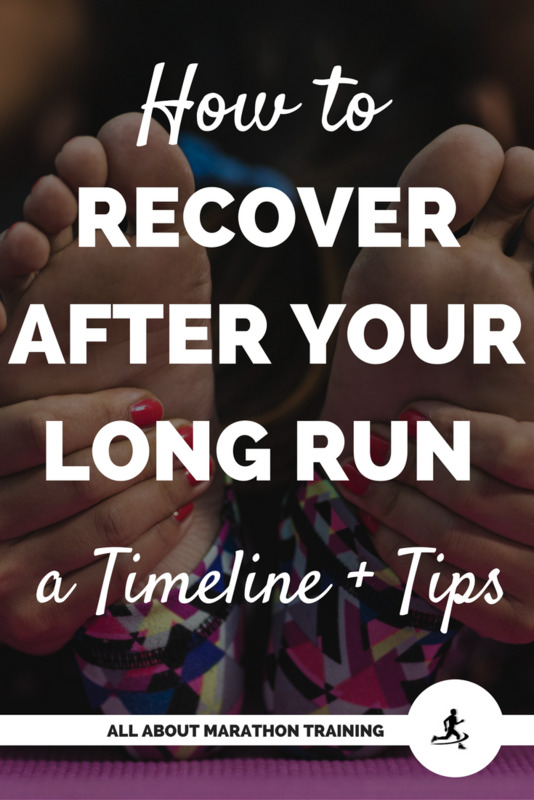 During weeks 5-10 you will increase your long run from 14 to 20 miles. You will complete two 20 mile long runs before you reach the starting line of the marathon. Your weekly mileage will increase from 25 to 35 miles. You will also be adding in some ﻿guidelines for interval training here - on Thursdays, in place of your strength training exercises that you did in the first phase of this marathon training schedule. During the final 2 weeks of this marathon training schedule you will be tapering – here is the science and more information behind the idea of tapering, and nutritionally getting your body ready and capable of running a marathon through carbo-loading. You can find how to carbo-load here + get a FREE high carb food list and menu plan. 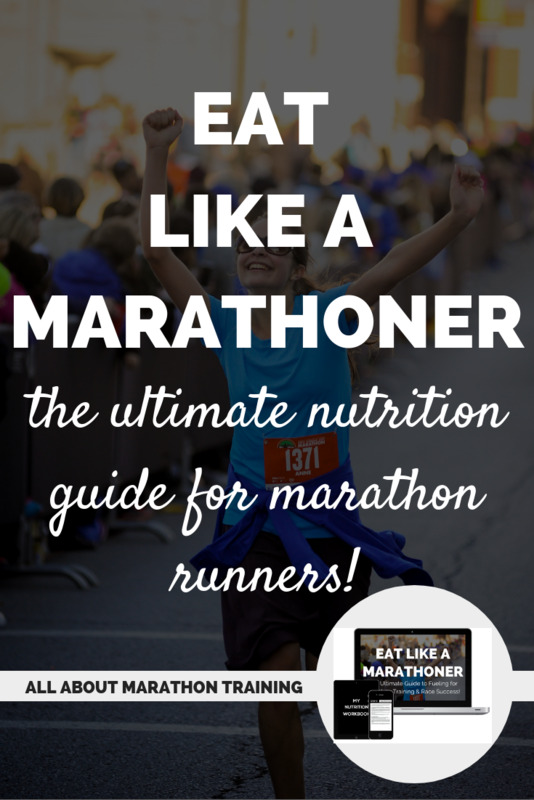 If you are going for a time goal, are afraid about hitting the wall, want a personal carbo-loading plan, race-refuel plan, and personal recovery plan (+ so much more all personalized to YOU), then your ultimate resource is the EAT LIKE A MARATHONER Nutrition Kit. 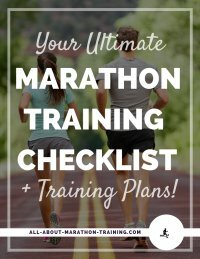 You will want to complete the 9 Step Marathon Nutrition Prep plan at least 2 weeks before your race day. Tuesdays: Tempo Run to improve your endurance and your ability to handle stress. Run these training runs at 80% of your VO2max or about 80% of your max heart rate. If you are not sure what your max sustainable pace is for your body, what your VO2 max is, or what a realistic pace is for you body,then, refer to our Runner's Pace Kit which will help you with all of this, and will tell you exactly what YOUR body can do and what paces YOU should train at for your long, tempo, and interval runs. Wednesdays: easy, short mile runs. These are more maintenance runs. Try to focus on your form and breathing during these easier runs. Run them at 70% of your VO2max or about 70% of your max heart rate. Thursdays: Strength or Speed Training depending on the phase you are in. You want these reps/intervals to be performed at about 97-99% of your VO2max pace or about 95% of your max HR. Your hill workouts are designated by “HT” on the training schedule. Your speed training sessions are marked as “ST”. Both markings are then followed by this form: 7 reps @ 1-1.5 minutes. Read this as, “7 repetitions at 1-1.5 minutes per each repetition”. This means that you will be running a total of 7 repetitions up the hill for HT and will try to run for at least 1-1.5 minutes for each repetition. Fridays: Rest day or optional cross training day. Take the rest day if you are feeling worn down otherwise a little cross training will do your body good. Cross-training is marked as XT on the schedule. Here’s a list of cross-training activities that I recommend and some to avoid while training. Saturdays: easy, short mile runs. These are more maintenance runs. Try to focus on your form and breathing during these easier runs. 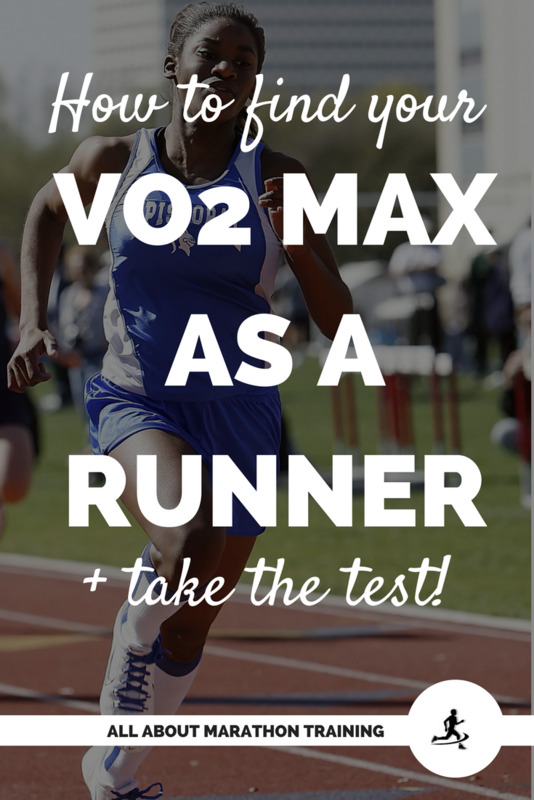 Run them at 70% of your VO2max or about 70% of your max heart rate. Sundays: Long, slow runs. Run these miles at about 60-70% of your VO2max or heart rate. The purpose of these is NOT to go fast but to target your aerobic system, increase your heart strength, and ultimately increase your endurance. Save your speed training and faster paces for Tuesdays and Thursdays. Review the plan below but first I will send you a free download for you to print out and mark up! Send me my FREE training plan! 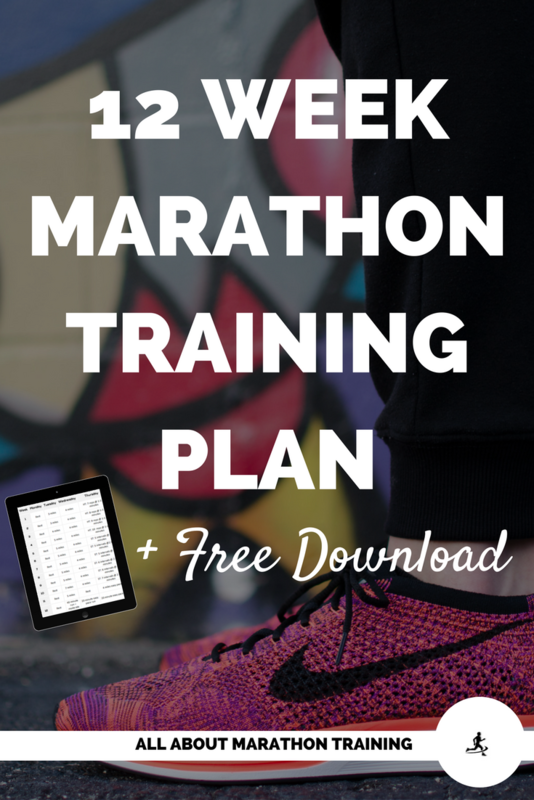 Have you signed up to get your FREE Training Plan Download?